This is an early contribution to the genre of slapstick by the Lumière brothers. Its simple plot is of a man’s repeated unsuccessful attempts to mount a horse. 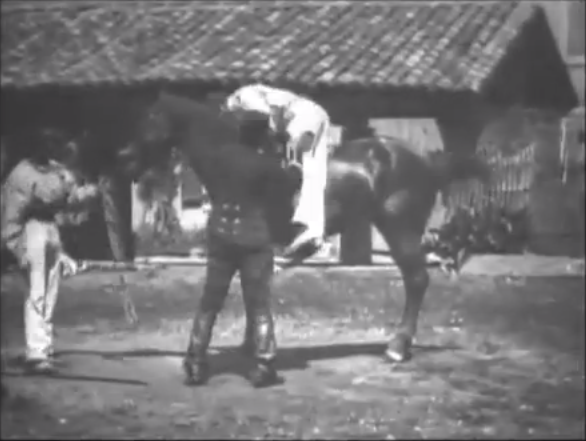 The would-be rider appears to be an acrobat, as his falls from the horse are, in general, quite graceful. It’s worth noting that in the world of 1895, horses were far more common, and “horseless carriages” were still novelties. That said, it hardly implies that everyone could actually ride a horse – many were relegated to riding in horse-drawn cabs, or driving horses from wagons. The true working class rode in trams, or simply went about on foot. Horseback riding in Europe was something the well-to-do prided themselves on, although the reality often was that they had little practical experience. Thus, this little vignette might be read as a gentle parody of the type of fop who boasts about his fine riding skills and then proves to have not the slightest idea how to handle himself in the saddle. In that sense, it seems to confirm that the Lumières made films with a higher class of audience in mind, although it is true that poor people like to laugh a rich people making fools of themselves also. That’s exactly what I look like when I’m trying to get on a horse. Ha! I might look even worse, if I ever tried it – at least this guy knows how to fall well!